With many career pathway options at NC, Sports Medicine stands out to students who want to pursue a future career in healthcare. Those who wish to pursue a career in the medical field see this class as an opportunity to further their knowledge in healthcare and potentially earn the credits they need before college. The class consists of three different levels. “I recommend Sports Medicine to anyone who is interested in pursuing a career in the medical field because not only does it teach you skills and terms you need to know for medical school, you have an opportunity to prove what you learned through performance-based activities,” junior Abbi Monet said. The first level class, Introduction to Healthcare Science, provides students with information about overall health, wellness, and preventive care. The second level class, Essentials of Healthcare, draws in students with a medical-focused anatomy course which additionally addresses the physiology of each body system. Basic life support skills in the second level class allow students to master certain skills via performance-based activities. The third level class, Sports Medicine, introduces concepts of physical medicine while also emphasizing knowledge of therapeutic sports medicine skills. Students must be able to understand medical terminology at a higher level and must also be able to demonstrate basic life support skills with performance-based activities. “In order to be a healthcare provider, one needs to have a good working knowledge of the human body. Most of the high school courses are centered around anatomy and physiology. 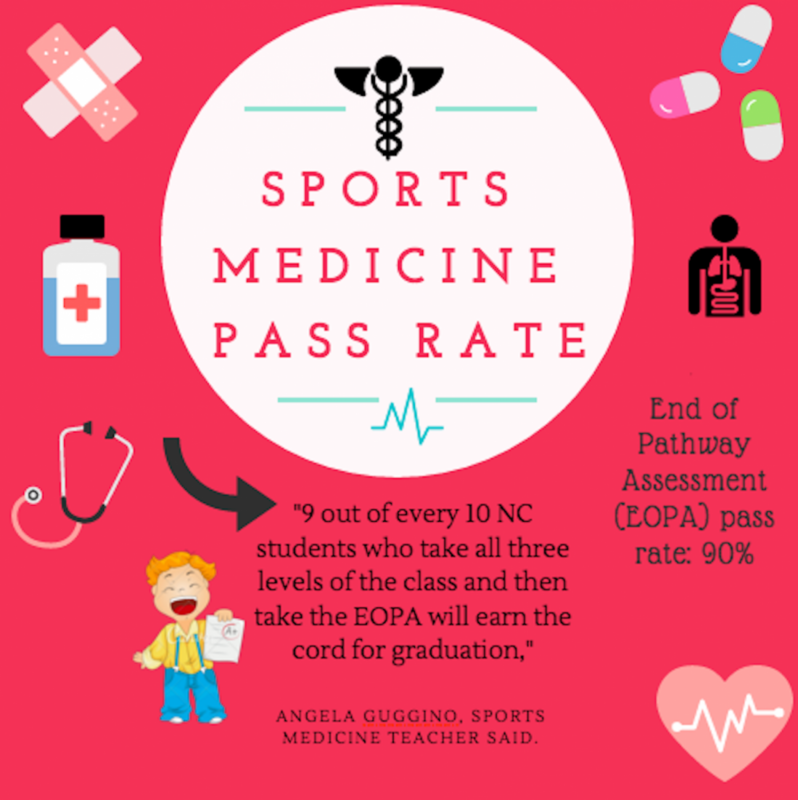 Students who start learning this in high school, develop a strong base on which to further build their knowledge in college,” Sports Medicine teacher Angela Guggino said. In addition to Sports Medicine, various other science electives give students the chance to better their understanding of certain aspects of medicine. Another class that could benefit students, Human Anatomy, stands out as an in-depth course that gives students an overview of the structures and functions of the major body systems. Students who take the second level class of Sports Medicine could easily earn the Human Anatomy credit if they wish to do so. Ms. Guggino recommends that students who seriously wish to pursue a career in medicine should take the Honors Human Anatomy course as a class instead of receiving the credit from her second level class, Essentials of Healthcare. 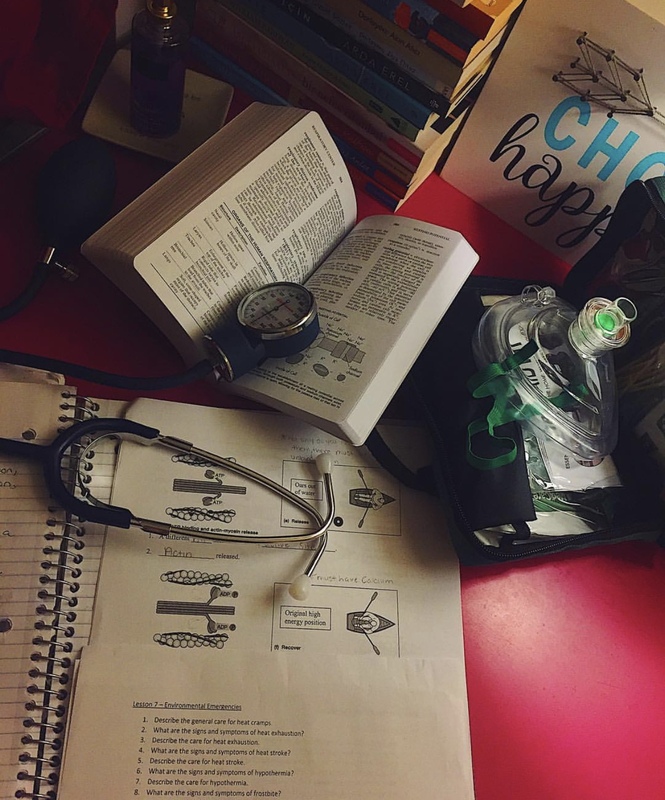 By taking various electives in the medical pathway, students will feel more confident in introductory courses in college because they already contain necessary background knowledge, hands-on skills, and an outline that most other students probably have not encountered before. “I feel like going to NC, we are given many opportunities based off the fact that we have over three thousand students. It makes me happy that it gives many opportunities for students to thrive. Magnet has given me a lot of opportunities, and it makes me happy that people who are not apart of the Magnet Program have that opportunity as well,” junior Andrew Riner said. Science classes that universities strongly recommend include AP Biology, AP Chemistry, and AP Physics. High school science teachers recommend that students should especially pay attention to any type of lab they complete because the labs will become more rigorous and time-consuming in college. Advanced math classes, also strongly recommended, will enable students to feel more confident solving real-world problems. The best math classes to take that could help students are pre-calculus and calculus. In some areas of medicine, statistics also help students solve the “missing” puzzle pieces. Nurses often use certain mathematical skills such as addition, ratios, and algebraic equations. They use these skills to deliver the right amount of medicine to their patients while also observing any changes present in their patient’s overall health status. In addition to this thought, measurements in medicine base itself off of the metric system, requiring the nurse to possess strong conversion skills. For example, a nurse must also know how to calculate the IV drip rates. The importance of researching the college you plan on attending after high school also plays a vital role in this case. For example, NYU School of Medicine strongly recommends that students complete English, Biology, Chemistry, Physics, Biochemistry, and Genetics in high school. Other universities, such as the University of Michigan Medical School, specifically pays attention to certain skills that help students qualify as a pre-med student. Such skills include academic excellence, altruism, written and verbal communication, integrity, reliability, and social/interpersonal skills. In order for students to develop even stronger social skills, several colleges recommend taking extracurricular activities that require communicating and helping others. Certain hospitals such as Wellstar Kennestone Hospital offers summer volunteer programs for students in high school that have interest in the medical field. Not only will this enhance one’s social skills, it will also help them better understand if they truly wish to pursue a career in medicine. The Medical College Admission Test (MCAT) includes questions about both Sociology and Psychology. While Psychology pertains as a course that deals with various mental illnesses, students will find that certain topics of Psychology and Medical Anatomy sometimes correlate which deems as a benefit for students by providing additional information. Students could take either on-level Psychology (Psych Y) or AP Psychology to potentially earn the college credit. While taking all of these classes may sound challenging, it helps students prepare ahead of time and makes their lives much easier in college by providing constant reinforcement that helps students retain the information for a long period of time. “I think that students have a wide variety of options to try different electives. If they have an interest, they take that class and it helps them prepare for their future and what they would potentially want to major in in college. Even if the class is an on-level class, it helps prepare them by choosing which college major. For instance, I want to be a vet so I took on-level Biology my freshman year and am currently taking AP Bio senior year. Taking this class in high school somewhat calms my nerves because I can get a jump start to what I want to major in in college,” senior Stephanie Crisfield said. Kennesaw State University (KSU) is often recognized for their successful nursing program. Students and staff work together towards success to improve their knowledge through various courses that help educate them for when they graduate in the medical field. KSU student Victoria Brooke Williams also finds it an advantage to take as many courses in high school as possible. “I’m a nursing student and also studying to be an Emergency Medical Technician (EMT). The amount of material that is required for a career in medicine is enormous and can often be overwhelming. It is so beneficial for anyone considering medicine to start their science studies in high school. There is no such thing as starting too early, especially when it comes to learning how to save lives. It is an amazing field that requires even more amazing people,” Williams said. The students who devote their time to the beneficial skills needed to become a healthcare worker find that they have a better advantage of becoming the successful student they wish to become once they find themselves in an advanced track once in college.